I discovered a small pile of cookbooks the other night as I was cleaning out a bedside cabinet. I must have pushed the books behind closed doors, (and conveniently) out of sight, while tidying up the house at some point. There they've been, undisturbed, for many, many months. When they re-emerged, I felt as if I'd come across a brand new pile of books - a little dusty, but aside from that there they were ready to provide me a few hours of reading on a particularly stormy afternoon. I tagged a few things to try, but one recipe in particular jumped out at me, the Apple and Carrot Shortbread from Good Tempered Food by Tamasin Day-Lewis. It's not as if we need another shortbread recipe highlighted on this site - there's already this one and that one. But this promised to be a shortbread of a different breed - this one was buttery, sweet, and flecked with shredded apples and carrots. Even better - I had nearly everything on hand to make them. I switched things up a bit from the original recipe, opting for a slightly more rustic version. For the sweetener, I thought a light Muscavado brown sugar would be nice alongside the apples - in place of white sugar. And I used a powdery-soft whole wheat pastry flour in place of unbleached all-purpose. And because I couldn't help myself, I tossed in some lemon zest for a bit of brightness. 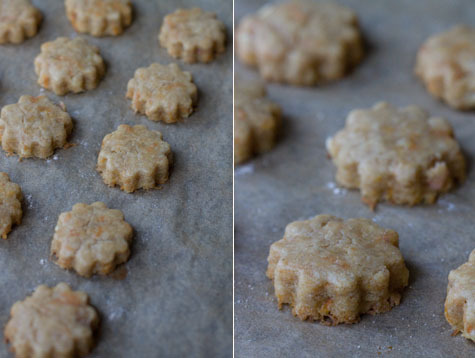 For those of you who are more particular about your shortbread, I should mention, these cookies don't have quite as much snap as a shortbread made without moist, shredded apples and carrots in the dough, but they are charming (and delicious) all the same. I had a couple alongside a cup of one of my favorite white teas - and I have to say, it was not a bad way to spend a few moments looking out our big windows at the trees whipping around in the wind outside. You're going to want to use metal (or sharp-edged) cookie cutters here, it will help cut through the shreds of apple/carrot more easily. If you can't track down whole wheat pastry flour, substitute unbleached all-purpose flour, or I suspect white whole wheat flour work just fine as well. Preheat your oven to 350F degrees, or 180C. 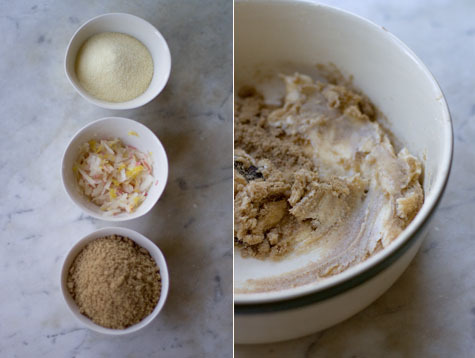 Sift the semolina, flour, baking powder and salt into a medium bowl, and set aside. When you're ready to bake the shortbread, roll the dough out onto a lightly floured surface 1/2-inch thick/1cm. 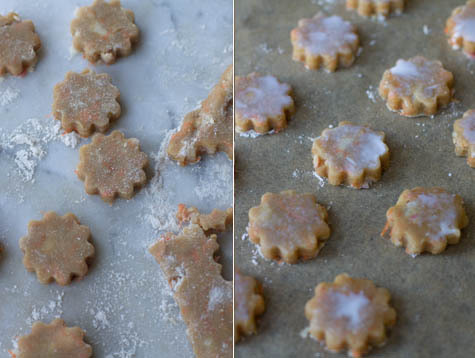 Use a metal cutters to stamp out cookies, then place them on a parchment-lined baking sheet. Brush lightly with a bit of milk and bake for about 10 minutes, or until the edges of the cookies start to brown just a bit. This recipe was adapted from Good Tempered Food: by Tamasin Day-Lewis. Published by Miramax (October 2004). A twist on the shortbread recipe I included in my book -perfectly golden pine nuts and just enough rosemary and lemon zest to infuse the buttery sweet dough with fragrance and flavor.